I don't remember the last time I played seriously with colored quadrilaterals. But I do distinctly recall that the experience didn't leave me misty-eyed and smiling. The blocks at my disposal in Thomas Was Alone managed to do exactly that. It's silly, really, for me to think of the playable avatars of Mike Bithell's indie platformer as characters. I mean, John wasn't a person with a complicated personal history. He… dammit! It, I meant to say it! It's nothing more than a long, skinny rectangle shape with some sound effects and movement conditions attached. Yet there I was, smiling at his egotistical altruism. 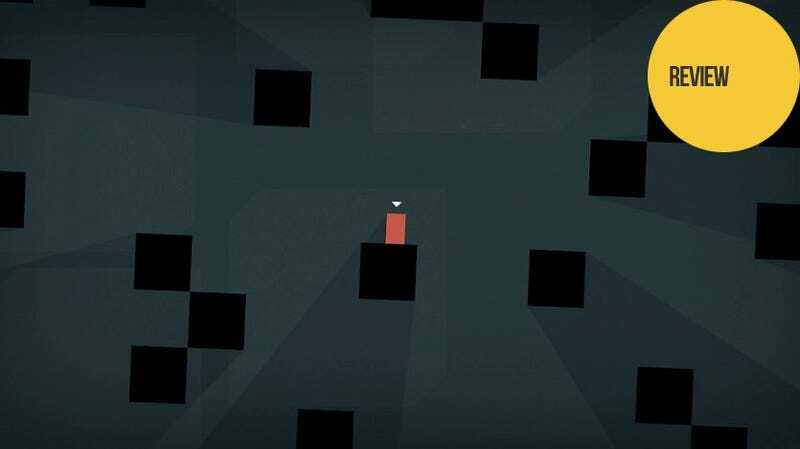 Amazingly, I felt more connected to Thomas Was Alone's colored, polygonal blocks than I have to most human characters in recent games. Part of the game's genius is how attached you feel to Thomas, John and the other tinted, four-sided personas you encounter in Mike Bithell's indie platformer. WHY: This smart platformer strips gameplay down to one single mechanic—jumping—and comes up with a challenging and poignant experience. Type of game: Puzzle platformer. What I played: Finished the game's 100 levels in about 12 hours. I never got tired figuring out the exact positions that the various blocky characters needed to be in to best deploy their different leaping skills. Narrator Danny Wallace wonderfully brings multiple different personalities to life as he tells Thomas' story. The lack of native gamepad support annoyed me, especially since the platforming gets really tricky later on. The framing narrative—told through quotes from programmers, digital psychologists and other off-screen personas—is that Thomas comes to sentience inside the server farms of mega-corporation Artificial Life Solutions. The IT cubicle slaves register Thomas, Sarah and the rest of their kind as bugs, algorithmic anomalies fit only for stamping out. The player's race from level to level takes on an urgency once those quotes get more and more hostile. Blustery narcissism, cranky neediness and occasional jealousy all pop up in the narration pinned to TWA's jumping squares. This game feels like a real investigation into the prickly, soaring thrill ride of actual companionship, complete with people you hang out only because you have to and icky social climbers. Bithell also shows off a knowing sense of who his audience is, with glancing meta-commentary and invocation of internet memes and obsessions that will get you laughing when they pop up. It's not just the clever writing or great narration by Danny Wallace that won me over. Thomas Was Alone manages to skillfully weave both those elements together with puzzle mechanics that themselves feel like a character arc. As these blobs of suddenly sentient artificial intelligence feel their way around their own personalities, the player's doing the same thing in the gameworld. And the game simply progresses by layering simple rules—space, height, buoyancy—on top of each other. But the results gel together in the form of tricky puzzles that will tease you all the more for knowing how elemental their solutions are. And peppered amongst the logic puzzles are a few levels that are simple yet maddening tests of reflex response. The sequences where you encounter James—Thomas' anti-gravity upside-down doppelganger—are amongst the most clever, orientation-teasing puzzles you'll play all year. And the ones that follow will similarly spin you around with wonder. Aside from its sharp puzzle design and cheeky voicing, TWA also succeeds aesthetically. Visually, it's abstraction of the highest order with nothing but right angles and straight lines. But watching the shadows rotate as you move, seeing the colors pop with significance and listening to the squeaks and blurps of the various sound effects will win you over you almost instantly. David Housden's procedural soundtrack ushers in a sonic atmosphere that's equal parts electronica, orchestral arrangements and chamber music, lending thoughtful, moody and propulsive energies to the whole affair. But, for all its charm, Thomas is more than just the super-minimalist-yet-incredibly-engaging tales of a few plucky AIs. It's the story of games. Of how they get made and played, of the joys and frustrations they bring and of the thousands of tiny iterative processes that go into evolving single titles and the entire medium into their best forms. It's about agape, that kind of love shared amongst a community. Thomas starts off alone but he sure as heck doesn't stay that way. He's got a legion of people waiting to love him. All they need to do jump up and move to the right, as it's been from almost the beginning of video games.